Time-lapse photography is a great way to show a flower unfolding, the sun marching across the sky, the process of building construction, and (over the course of a year) the change of seasons. You can take time-lapse photos in two ways. One of them is pretty easy, works only with some dSLR cameras, and might require special software. You can use the other way with any dSLR and don’t need to use any special gadgets or applications. A third-party remote control application may work with your dSLR, and some models have time-lapse capabilities built right into the camera itself. The images automatically download to the computer when the camera takes them, so you can take many more pictures in sequence than you could fit on a single memory card. The other way to shoot time-lapse photos requires more effort on your part. You don’t need special software, and you don’t need to connect your camera to a computer. Instead, you can use a digital tool (that is, the index digit of your right hand) to trigger each picture. Set your camera on a tripod and press the shutter release (or use a remote-control/cable release) to take a picture at the interval you select. You may find this process tedious, and it actually works best for long-term sequences, such as construction progress pictures or changing seasons shots. 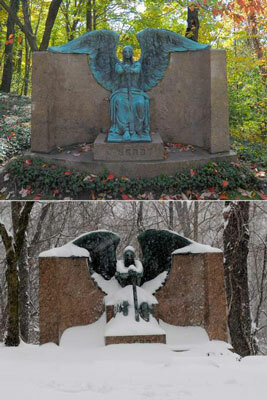 The figure shows the same monument in autumn (top) and in winter (bottom). The light is different in winter, which is why the same monument looks dramatically different from one season to the next. To take a series of photos, set up your camera in the exact same spot at intervals. You can most easily position your camera in the same spot every time by mounting the camera on a tripod and recording the height of the legs, the extension of the center pole, and the tilt and angle of the tripod head. By using this information, you can repeat your setup any time you want and take a series of pictures over the course of a few days or even a year. Be sure to use the same lens or zoom setting for each photo, too.